Sony’s mobile PC users are the most widely-shopping customers. They regularly visit more retail and online shopping outlets than any other brand’s customers, with an average of 8.1 outlets compared to the average of 6.4. The top eight outlets for Sony customers in ranked order are Wal-Mart, Best Buy, Target, Amazon, Barnes & Noble, eBay, Walgreens, and Office Depot. 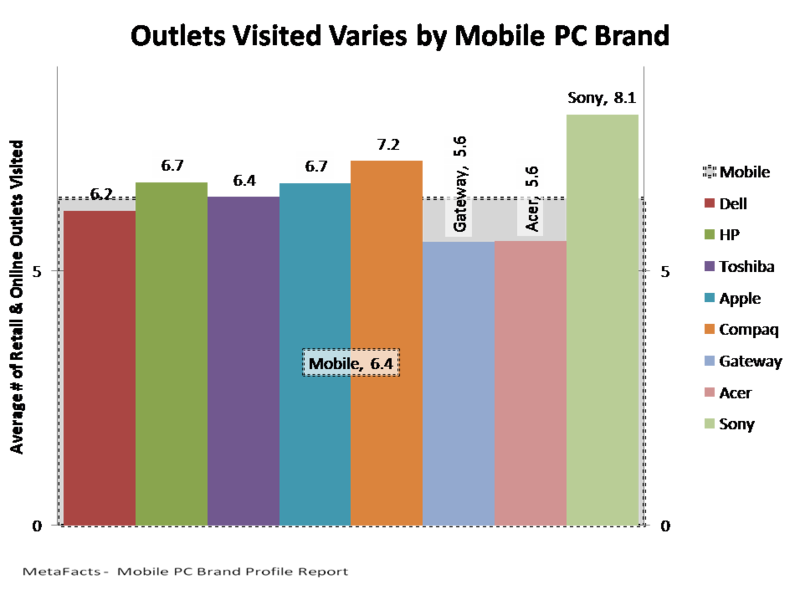 At the low end of the shopping spectrum are Acer and Gateway’s mobile PC users, who each visit the least number of outlets, at 5.6 each. Their top six outlets are the same to each other, if ranked slightly different: Wal-Mart, Best Buy, Amazon, Target, eBay, and Walgreens.